It's slice of life, comedy, and romance. Only one episode so far, but it's really good at setting the scene and the feeling for seemingly the rest of the anime(?). Just watch it to decide if you'd like it or not, it would be more informative than another person's wall of text. This is especial here because the first episode is so good at being an exposition, you can probably grasp the kind of show it'll be from just the first. Though, perhaps is more to be expected. TL;DR: Just watch it. If you like it, you should probably watch more. If not, maybe not. I believe this is a great anime with a lot of potential. The premise is quite an easy one but the characters are lovable. It will be interesting to see how's things Will develop. Finally I am pleased to say that an otaku female character is a nice thing. This anime makes me laugh. The humor in this made me laugh quite a bit. I think the guys are a bit annoying (but I tend to think that for a lot of animes), but what really sells it for me is the main female character. She's adorable and her awkward obsession with hot guys is hilarious. She makes this show worth my time. Despite some of the uh, controversial things in the beginning(idrc though), it's hilarious. And its also incredibly stupid. I'll probably watch all of this because I love cheesy things. And boy oh berto this is cheesy. To the point of being stupid. God help us. I love it. Don't expect anything too "anime of the century" here, it's a reverse harem. ive only seen 1 episode (two are out as of now) but i think i already have a good idea to what it's gonna be like. all season. this show is 'light hearted' and cute and everything, but people are giving it just a bit too much credit. But if you don't critique every little thing (or joke) like i do just turn off your brain when you watch this and you'll have a good time, the guys actually make this one worthwhile and it is a half funny show. seeing the 5 star reviews though...even in this genre, maybe watch a few better shows before spending time on this one? The thing about this show is that it is painfully aware of what it is. Honestly, I kinda like it that way for the sake of brevity let me explain it like this. It's a comedy about a nerd that would have never gotten the guy for what she looked like but when you remove that element, the guy falls to her feet. I'm already seeing reviews and comments about this whole thing of the whole "Fat-phobic" thing, but you have to remember, this is an animated show about a nerd that would have never gotten the guy for what she looked like but when you remove that element, the guy falls to her feet. And it's painfully aware of that, in fact, we have already seen the results right away from the first episode. Kae even says it herself, she may look different but her personally hasn't changed. I think this show more represents the person and her habits than about anything else. I like this show because it's funny, it's self aware, and it's not taking itself seriously. So far, this anime is way too funny and beautifully animated. The comedy is good, solid stuff that really makes you chuckle and we all like a good romance! I think this is gonna shape up to be something really great by the end of the series. Animation, characters, story; I really like all of it! However, I gotta give it 4/5 for the controversial fat/thin item it has going on. But really, I will watch all of it I'm sure. This anime is absolutely adorable, two episodes in and it's still just as cute. A simple slice of life story sprinkled in with some hinted BL it's a perfect break from some more serious animes. I highly recommend this anime if you enjoy a good laugh or two. Only 2 episodes in and I am thoroughly enjoying this show! It is absolutely hilarious and perfect for any female (or male) otaku with a soft spot for otome or BL content. 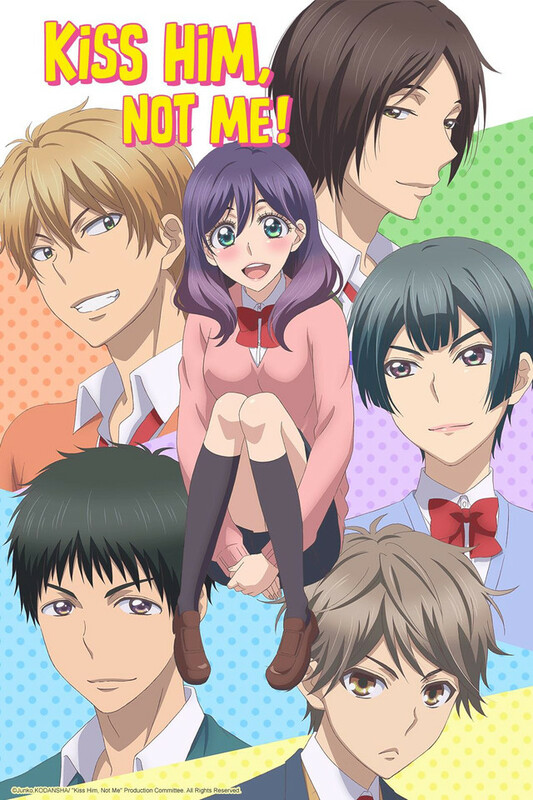 Even if you don't enjoy those things I would still totally recommend, great slice of life, romance, comedy!!! Enjoy!